MAME at Human Race Theatre is an ambitious project; taking a cast this big and producing a musical in The Loft space is never an easy task. Unfortunately, I was unable to stay through Act 2 (as a warning, Act 1 runs around 90 minutes). It’s a classic old musical, exactly the kind of show perfect for a Sunday matinee. Based on a novel by Patrick Dennis, the story is about a bohemian woman, in love with a lavish lifestyle during the Depression. Shows like this are star vehicles; the title role requires a ferocious broad in order to land firmly. Lisa Ann Goldsmith plays her more restrained, almost broken instead. There are a couple of interesting performances, though. Scott Stoney, as usual, commands the stage, showing an assertive fire in his belly that could have given Mame a formidable opponent had she roared back with the same intensity. Mame’s best friend, “Vera Charles” played by Torie Wiggins, is an unusual choice. Wiggins is a pro, though, and I enjoyed what she brought to the role. It’s always nice to see her be given a new challenge to tackle. The show does feature some great choreography from Katie Johannigman. Dance Captain Sarah Agar and Michael McCrary shine in the big dance numbers; as performers they are simply in another league from most of the rest of the troupe. Agar is a Wright State graduate who’s worked on this stage before (“Band Geeks”) and in productions of dance heavy shows like “White Christmas” and “Anything Goes.” She also has a classic musical theatre look and I expect we’ll keep seeing her on stages for a long time to come. McCrary is a veteran of national tours of “Shrek” and “Oz” and is a graduate of Boston Conservatory. His stage presence, crisp dancing, and professionalism are highlights of the show. I’d like to see more from him in the future. The costumes and sets are fun (though I don’t know who designed that tiny bed), the live orchestra is nice, and the audience really seemed to enjoy the big production numbers. MAME is a wild romp through an era in American history that is now thought of quite fondly. And with classic numbers like “We Need a Little Christmas” and “Bosom Buddies” for some its a wonderful throwback to an era of musical theatre that is missed. 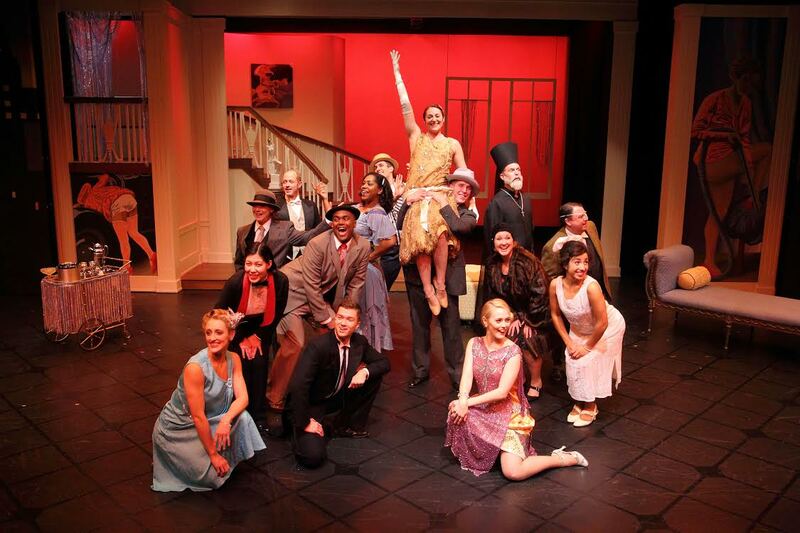 MAME runs at Human Race Theatre Company in downtown Dayton at The Loft Theatre through November 23rd. For more information, click here.